The Supreme Court has upheld the sentencing of six former leaders of the yellow-shirt People’s Alliance for Democracy to eight months in jail each for breaking into Government House in 2008. Prime Minister Prayut Chan-o-cha is not permitted by law to help the Palang Pracharath Party (PPRP) to canvass for votes, said Deputy Prime Minister Wissanu Krea-ngam. Thailand’s exports are expected to see the lowest growth in three years because of the Sino-US trade row, a global economic slowdown and the strengthening baht. The Elections Commission (EC) on Wednesday decided to recommend that the Constitutional Court dissolve the Thai Raksa Chart (TRC) for nominating Princess Ubolratana to be its prime ministerial candidate. The Thai Raksa Chart Party (TRC) has asked the Election Commission for a chance to defend itself amid reports EC will seek its disbandment for nominating Princess Ubolratana as its candidate for prime minister. The Bank of Thailand expects debtors at non-bank financial institutions to participate in the central bank’s Debt Clinic by the second quarter of this year. The Cabinet has resolved to make Friday April 12th, 2019, a national holiday, following the request from the Secretariat of the Cabinet. A deputy mayor of tambon Wiang Lo in Phayao’s Chun district has been arrested for breaking into a police database to steal records of individuals for sale, police say. Foreign Minister Don Pramudwinai says good relations between Thailand and Bahrain helped extricate Thailand from the controversy surrounding the Bahraini extradition request for footballer Hakeem al-Araibi, who has refugee status in Australia. The immigration chief of Mukdahan has been transferred after his juniors let seven detained Muslim Uigurs flee the detention centre. Tour operators in Krabi are pushing for related government officials to solve the problem of foreigners illegally selling tour packages on Koh Phi Phi. The Phuket Provincial Office of the Department of Disaster Prevention and Mitigation (DDPM-Phuket) announced today (Feb 13) that a provincial tsunami evacuation drill will be carried out in Patong next month as authorities prepare for a regional exercise in April or May. The government will continue to seek a solution to the petition by the top three mobile operators asking for a delay on the last payment of bid fees for the 900-megahertz spectrum auction, following a failure yesterday to reach a resolution. What does it take to shush a Shinawatra? Apparently more than being exiled or overthrown by a military government. Voice TV, a pro-Thaksin digital broadcaster known for its critical coverage of the military, went off the air at midnight as ordered by the broadcast regulator. The US aircraft carrier USS John C Stennis has been anchored at the Laem Chabang deep sea port as a display of the close military ties Thailand enjoys with the United States. On 8 February 2019, the final day for announcing prime ministerial candidates, all eyes were supposed to be focussed on whether junta leader Prayut Chan-ocha would throw his hat into the ring. THE Thai Retailers Association (TRA) on Monday said consumer spending is growing at a less than optimal rate in the first half of this year and has suggested that the government consider cutting taxes on luxury goods and launch campaigns such as a “Thailand Grand Sale” to attract tourists. In 2018, Thailand’s military junta-appointed parliament gave the Thai people a “Christmas gift” by voting to amend the 1979 Narcotics Act, legalizing cannabis for medicinal and research uses. The decision is the first of its kind in a region that has long been notorious for its extreme drug laws, harsh sentences, and overcrowded prisons. 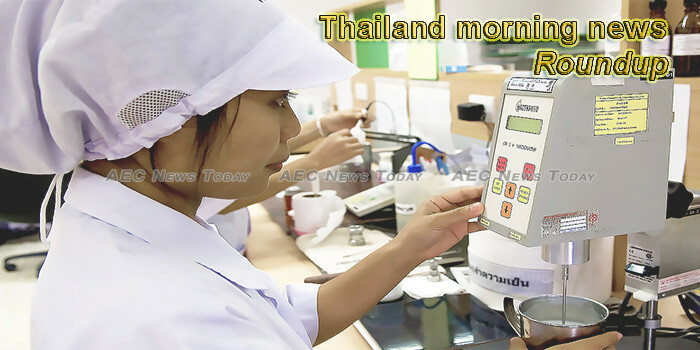 The Royal Thai Government has held several meetings to discuss preparations for the royal coronation scheduled in May. The Pharmacy Council has asked the national committee on hazardous substances to ban two herbicides, paraquat and glyphosate, and the pesticide chlorpyrifos before year’s end in the interests of public safety. A gunman has opened fire at a Malaysian garage owner in Narathiwat’s Sungai Golok district last night, killing him and severely injuring a Malaysian employee. ONB News is reporting that Koh Samui is “awash with drugs” and that the local prison was crammed full of prisoners convicted on drugs charges. The captain of the tour speedboat that slammed into an oil tanker off Phuket’s east coast while returning from Phi Phi Island on Saturday (Feb 9) faces a criminal charge of recklessness causing injury – and will have his boat operator’s licence suspended and the speedboat itself temporarily de-registered. Average prices of land plots and condos in inner-city locations will be flat this year because of pressure from a massive oversupply that remains unsold, according to property consultant CBRE Thailand. The Department of Internal Trade (DIT) has organized the Blue Flag Fair in Songkhla province to assist those affected by severe weather conditions caused by tropical storm Pabuk earlier this year. Thailand is eyeing economic opportunities in the 17th Meeting of the ASEAN-Korea Free Trade Agreement Implementing Committee (AKFTA-IC) in Seoul from February 12th-14th. Given the close cultural and religious ties between Sri Lanka and Thailand, measures are being taken to promote bilateral tourism between the two predominantly Buddhist nations. The President of the Thailand Convention & Exhibition Bureau (TCEB) has indicated that the MICE businesses in Thailand has a bright future, with more than 6.6 million local and foreign MICE travelers visiting the Kingdom over the first quarter of the 2019 fiscal year. Thai Fight and the Sports Association of Phuket are jointly hosting the inaugural ‘Thai Fight Phuket’, a televised international sport entertainment event showcasing Muay Thai boxing and promoting Phuket tourism. Thai police have announced the arrest of 51 year old Jan Olof Norlander for alleged money laundering following the arrest of his accomplice last November. Education expert Sompong Jitradub has urged the Office of the Basic Education Commission (Obec) to do more in its bid to purge bribery from state school admissions by scrapping all seven special entry conditions instead of only three. The Thai steel industry has warned the government that thousands of workers could be laid off if it does not take any action to stem the influx of cheap Chinese imports that are expected to reach a record amount this year. Several political parties debated public healthcare policy at a recent forum, with many resolving to upgrade the standards of Thai healthcare services to be equitable and comprehensive across all social demographics, while opposing tiered hospital care. The cabinet approved an agreement between the governments of Thailand and Myanmar to suppress human trafficking and eliminate the trafficking at organizational level effectively and in timely manner. People rushing to soak in a “magic mud” found oozing from the ground in Ban Luam district, and even drinking the water, have been warned it’s highly alkaline and more likely to cause illness than cure it. Cement demand in Thailand is forecast to increase in the next few years after a recovery in the private construction sector, says Fitch Ratings. by Inked In Asia and Carl Gulliver We know for many it might be a holiday whim, while for others it may require months of planning and preparation. Here are some common topics and questions for getting a tattoo in Thailand.